In 2019, Jake Lawson heads the construction of Project Dutchboy, a network of satellites coordinated from the International Space Station, that neutralises extreme weather patterns caused by Global Warming. However, Jake is pulled up before a congressional panel and grilled over his antiauthoritarian attitude and then fired and replaced by his brother Max. Three years later, Dutchboy is about to be handed over to international jurisdiction when there are a series of weather malfunctions – a whole town frozen in Afghanistan, Hong Kong devastated by geothermal explosions. To determine the cause, the US government assigns Max to bring a reluctant Jake back and send him up to take charge of Dutchboy again. In orbit, Jake determines that someone has been sabotaging the satellites and covering up evidence. At the same time, attempts are made to kill Jake with a sabotaged spacesuit. Both he and Max uncover that someone with access at the highest levels of government is behind this. As the Dutchboy satellites start heading for a major malfunction, Max tries to get the codes from a possibly complicit The President that will reboot the satellites before this creates a Geostorm – catastrophic weather running amok all over the globe. Dean Devlin is a name mostly known for his collaborations with Roland Emmerich. Devlin started in the industry as an actor and has a minor number of roles, mostly in tv shows – he can be seen in small parts in films like Real Genius (1985) and Martians Go Home (1990). The turning point was when he appeared in a supporting role in Roland Emmerich’s Moon 44 (1990). From there Devlin and Emmerich formed a partnership that lasted for the next decade, Emmerich directing, Devlin producing and the two of them usually writing works such as Universal Soldier (1992), Stargate (1994), Independence Day (1996) and Godzilla (1998), as well as creating-producing the tv series The Visitor (1997). Devlin and Emmerich appeared to part ways after producing Eight Legged Freaks (2002), although did reteam a few years later for Independence Day: Resurgence (2016). Following his split with Emmerich, Devlin seemed to disappear off the radar for several years, turning up to produce the odd work such as Cellular (2004), the tv mini-series The Triangle (2005), The Librarian tv movies and subsequent tv series The Librarians (2014-8) and the tv series Leverage (2008-12) and The Outpost (2018– ). Geostorm marks Dean Devlin’s debut as a director, although he had previously directed several episodes of both Leverage and The Librarians. The film was originally completed in 2015 for a 2016 release date but this was pushed back several times to October 2017. Part of the reason for the delays was that the completed film rated poorly with test audiences and so an uncredited Jerry Bruckheimer was brought in to oversee substantial reshoots. The film’s release was not given much publicity by the studio and received atrocious reviews, only ending up earning back $32 million on a $120 million budget in US release. It is clear that Dean Devlin has been given orders to go and make a Roland Emmerich film. The plot of Geostorm feels like a distillation of all the principal themes that run through Emmerich’s films. Aside from the fact that the film has been mounted as an Emmerich-styled mass destruction spectacular, the worldwide ecological disaster reminds of Emmerich’s The Day After Tomorrow (2004), while the plot of the weather control satellite being co-opted by the US military as a weapon feels like it has been uplifted from Emmerich’s first film The Noah’s Ark Principal (1984). Meanwhile, the B-plot about a Secret Service agent fighting a conspiracy to eliminate The President could have come from Emmerich’s White House Down (2013). One of the distinctive elements of many Emmerich films is their strong advocacy of pro-environmental issues. Devlin has clearly taken this on board – Gerard Butler drops out to build electric motors, Daniel Wu is seen recharging his electric car in the Hong Kong scenes, while the entire plot is about an improbable scheme to tame the effects of Global Warming. One of the features of Roland Emmerich’s films is the absurd science, if not an actual preference for pseudo-science – the theories of Erich von Daniken, Whitley Streiber and Art Bell, belief in Mayan 2012 prophecies. The wilful ignorance of science goes into overdrive here. In the Hong Kong scenes, Daniel Wu exits from a convenience store and walks to his car before he drops some groceries only to see the eggs fry on the street. You cannot help but wonder how he could not have noticed while walking to his car that the pavement underneath his feet less than a foot away had suddenly grown so hot that an egg would instantly fry on it. One of the big bugbears of the film for me was the on again/off again gravity on the space station. We see that zero gravity is in existence when Gerard Butler is travelling up in the shuttle and they later make an EVA sequence in spacesuits to retrieve the hard drive. The station is seen as rotating so we can assume there is some kind of centrifugal gravity in operation yet as soon as they are inside the station everybody walks around as they would on the ground. One of the most irritating aspects is during the EVA sequence – how Gerard Butler manages to crash and bounce across the station and the debris is seen falling. In fact, a zero g environment mandates according to Newton’s Second Law that without gravity and atmosphere impeding him when Butler impacts with something he should vector off in the opposite direction with the same amount of momentum. Here he (and the debris) are seen bouncing up and then falling back down as they would do if they were in a standard gravity environment. The one thing that any Roland Emmerich film always has is effects spectacle. Geostorm tries to do this but is operating with a less than stellar budget. The Hong Kong sequences look particularly weak in this regard – as though they had been lifted from a B-budget Syfy Channel disaster movie rather than made with a $120 million budget. 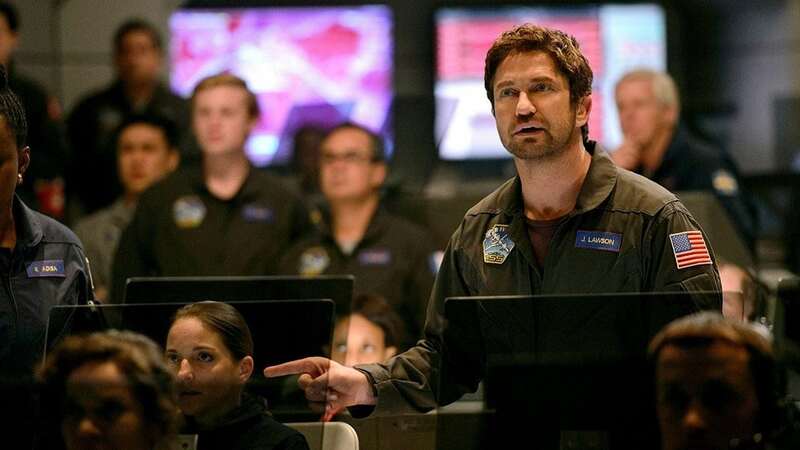 Certainly, the film features some top drawer sequences elsewhere – an enthralling sequence with Gerard Butler crashing across the space station, the climactic destruction sequence. Devlin does have a way of creating unusual images – the supreme weirdness of a plane frozen in mid-air as it crashes down across the streets of Rio. On the other hand, the scenes with Abbie Cornish stunt-driving The President about in a rent-a-cab while mass destruction rains down are absurd no matter what way one wants to look at them. Dean Devlin subsequently went on to direct the thriller Bad Samaritan (2018).